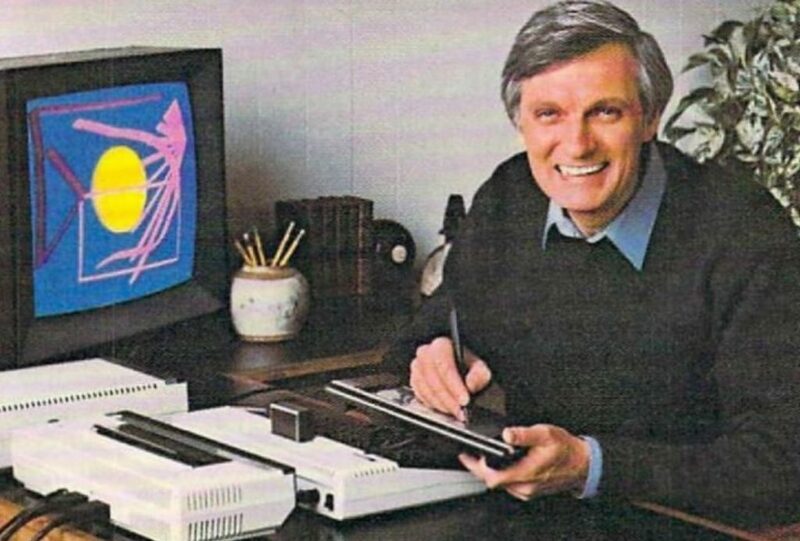 I got an Atari Touch Tablet along with the Atariartist cartridge for Christmas back in the early 1980s. This was one of my favorite Atari gifts ever. I had so much fun with this thing. I really liked making digital art on the Atari 800 and the Touch Tablet made it so easy. 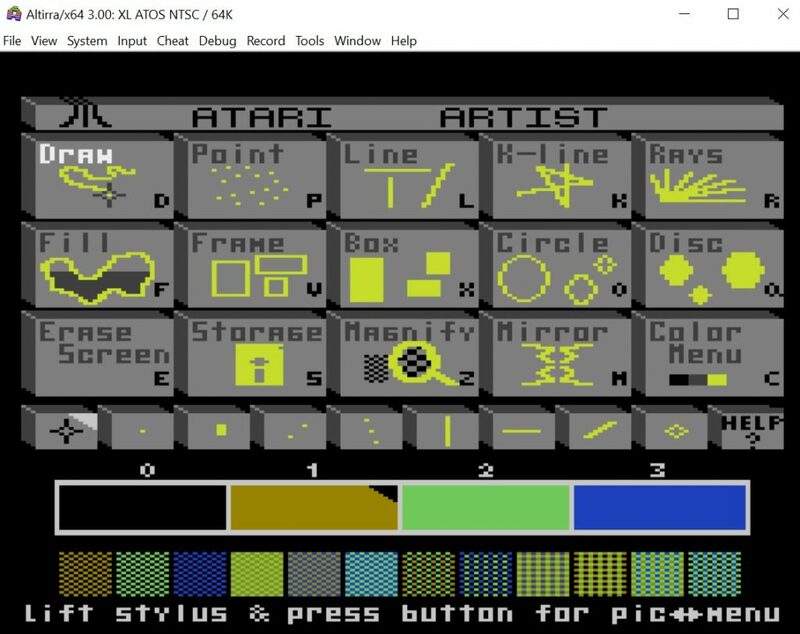 The Atariartist software had a great graphical menu that you could use to select colors and drawing modes. You could then click the red button on the stylus to switch to the drawing screen and back again to the menu. This was all very seamless. I still have my original Touch Tablet and picked up another one locally in an original box last year. These are relatively easy to get if you don’t have one. You can usually find them on eBay for about $50 loose or maybe $100 if boxed. As of this post, you can also get them new in the box for $50 from Best Electronics. A neat thing about these is that they are easy to program for. The X and Y coordinates are mapped onto PADDLE(0) and PADDLE(1) while the left and right buttons are mapped onto PTRIG(0) and PTRIG(1). There is a red button on the stylus that is mapped onto STICK(0). This makes it easy to read the input from device and use that however you want. I have found two demos that highlight this in BASIC. The first is a simple program (TOUCHPR.TXT) that reads the inputs and prints them on the screen. This code appeared in the reader feedback section of Compute! magazine from 1986. The second program (TOUCHMUS.TXT) loads some machine learning code to read the inputs during the vertical blank and then turns them into music. I got this one from the Atari Assembly Language Programmer’s Guide book (see page 278). I have also made an ATR file with both programs in BASIC. Purchase an Atari Touch Tablet for $50 from Best Electronics. Try the Touch Tablet with the included Atariartist cartridge. If you got your tablet without the cartridge you can get the ROM online for use with a flash cartridge like Atarimax. That link also includes the ATR that you boot using SIO2PC. Here is the manual. Try the two Touch Tablet demos I mentioned above (TOUCHPR.TXT & TOUCHMUS.TXT). You will want to use these on original hardware as the tablet doesn’t work with emulators. Here is the ATR file. This was one of the first commercial tablet input devices for any home computer. It was certainly a winner. Here is an Alan Alda commercial highlighting the device. Here is a Compute! article from 1984 on the tablet and the Atari Light Pen. Here is an Atari Age thread with some great photos of artwork made with the tablet.